**Disclosure: We were provided with a complimentary copy of the book. No monetary compensation was received. FORKS OVER KNIVES FAMILY is simply for today’s families who want their kids to eat healthier. My family has struggled with gravitating to what we know and grew up with. We have tried a plant based way of living a couple times, and while we could definitely see the change, it was hard to adjust and keep it up. 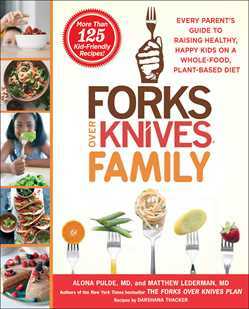 I loved the first book Forks over Knives and was excited to learn they had a family edition coming out. We will be making our first dish from the book this week and I will be posting pictures on our social media accounts to let you all know how it went and what the family thought! This is Every Parent’s Guide to Raising Healthy, Happy Kids on a Whole-Food, Plant-Based Diet by the husband and wife doctor team Matthew Lederman, M.D. and Alona Pulde, M.D. They also appeared in theForks Over Knives documentary and are authors of the New York Times bestseller The Forks Over Knives Plan (Touchstone).